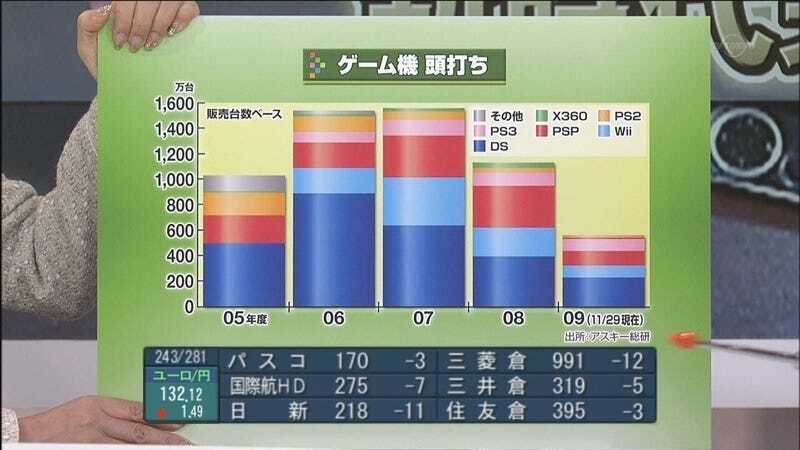 This colorful graph from the TV Tokyo news shows console sales in Japan from 2005 to 2009. Each platform is color coordinated, and there is a color key in the corner. The gray box that reads その地 means "Other". The numbers on the side start at 2 million and max out at 16 million. Notice the drop off in 2008 and then 2009? Notice anything else? Well, besides the lady's fancy finger nails. That's right, the Xbox 360 has all but disappeared from the sales tally. 2008 saw Xbox 360 games like Tales of Vesperia. 2009 didn't. At least the PS2 is still hanging in there!